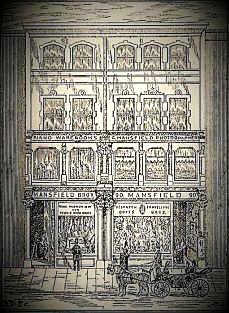 "Messrs. Mansfield, Musical Instrument Sealers and Fancy Goods Depot, 89 and 90, Grafton Street.— An old-establisment and eminently reliable firm engaged in dressing-bag and despatch-box manufacture, and the importation of Parisian and Viennese fancy goods, in addition to trading in music and musical insstruments, is that so wellknown throughout the country as Messrs. Mansfield Bros., of 89, Grafton Street, a leading thoroughfare in the city of Dublin. This house was founded many years ago, and since the commencement conducted operations on a scale of considerable magnitude, until, at the present lime, there is not a more influential concern in its different branches of industry than the one under notice. The premises occupied comparise a handsome shop and ware-rooms, and are well litled and appointed for the reception of a high-class cliailfle, who resort to the shops and take delight in appreciating the splendid displays of golds on view. Valuable and comprehensive stocks .are maintained, compiising a first-class selection of musical instruments, includng a choice variety of pianofortes, harmoniums, and American organs obtained from the leading fon-ign and English manufactories. Amongst the varied stock of pianofortes will be found specimens of the world-renowned makers — Collard & Collard, Kirkman, Broadwood, Cadby, etc., both new and secondhand, at prices to defy competition. DUBLIN - "Mr. John M'Cullagh, Pianoforte Maker, 6, Donegal square, North, Belfast. 1243 Cottage pianoforte, 6 3/4 octaves, double action; in rosewood case and octagon legs with carved tops, fret cut front. 1244 Cottage pianoforte, 6 3/4 octaves, brass centre mechanism, Victoria fall, carved trusses, repetition under hammer, and fret cut front. 1245 Picola pianoforte, 6 3/4 octaves, brass centre mechanism, repetition under hammer, rosewood case, octagon legs, with fret-work. 1246 Cottage pianoforte, 6 3/4 octaves, with repetition under hammer, brass centre mechanism; in rosewood case, and carved trusses. Square pianoforte ca. 1790-1800, Frederick Historic Piano Collection, Ashburnham, M.A., U.S.
Square pianoforte ca. 1775-1800, National Museum of Ireland, Dublin, U.K.
Square pianoforte ca. 1790, Private collection, England, U.K.
Square pianoforte ca. 1790, National Museum of Ireland, Dublin, U.K.
Square pianoforte ca. 1800-25, National Museum of Ireland, Dublin, U.K.
Square pianoforte ca. 1807, National Museum of Ireland, Dublin, U.K.
THREE HUNDRED PIANO-FORTES, He is enabled to submit to Public Inspection an assortment of Instruments of all classes in greater variety than will be found in any House in London, and of quality equal to any yet manufactured by the most eminent London Makers-_viz., BROADWOOIL COLLABD, and TOMnssos, comprising Grand, Semi-Grand, Cabinet, Cottage, and Grand Square Piano-Fortes of the very latest construction. °.' Old Instruments taken in Exchange. A numerous selection of Double and Single-action Harps, by Ernrd and others. 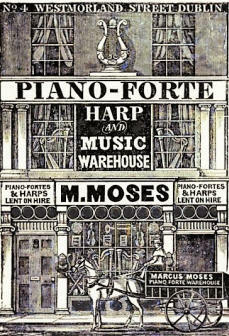 PIANO-FORTES, HARPS, &c. FOR HIRE, by the Week, Night, or Month. Accordions in great variety, with from six to nineteen Keys, and Semitones. Panormo's and Foreign Spanish Guitars, Seraphines. Music Paper, Portfolios, Blank Music Books, Music Slates, Ruling Pens, Piano-forte Wire. Rndsll, Nicholson, and Monzani's Flutes. Violins, Violoncellos, Flagcolets. Foreign and English Harp, Guitar, and VIOLIN STRINGS; and every other article connected with the Trade, of the best description. A regular weekly supply from London of the newest Musical Publications. PIANO-FORTES Tunnn and Rnrmaen, Psckgd for the country, &c. &c.
most improved construction, by Broadwood, Collard, Tomkisson, and Errard, constantly for Sale, at the lowest London prices. Old Instruments taken in exchange at their highest value. Double and Single-action Harps by Erard and others. Piano-Fortes, Harps, &c., for Hire, in Town or Country, by the Week, Night, or .Mont-h. Accordions, in great number, the best German and French. Spanish Guitars, by Panormo, and approuved Foreign Makers. 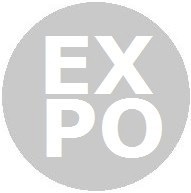 Music Paper, Portfolios, Blank Music Books, Music Slates, Flutes, Flaneolets, Violins, Piano-forte Wire. Superior Roman and Bnghsh Harp, Guitar, and Violin Strings, and every other article connected with the trade, of the best description. Succeeded by CRAMER in Dublin, same address. NEW PATENT REPEATER GRAND PIANO-FORTES, with drilled Brass Bridge, &c., in Mahogany and Rosewood. BICHORD GRANDS, of 6 1/2 Octaves, with New Patent Repetition Action. SEMI-GRANDS, with Grand Piano-Forte Action, in Rosewood, Zebra-wood, and Mahogany. SUPERIOR EXTRA SIZE GRAND SQUARES of 6 1/2 Octaves, Repetition Action, in Ocean-wood, Rosewood, Zebrawood, Ornamental and Plain Mahogany. PATENT IMPROVED PIANO, and GRAND-SQUARE PIANO-FORTES, of Six Octaves, with Repeater Action and Metallic Centres, in Mahogany, Rosewood, Zebra-wood, and Ocean-wood. COTTAGE, CABINET, and SEMI COTTAGES, with Grand Piano-Forte Action, in Rosewood and Mahogany, various styles of finish, plain and high ornamental. All of which he is enabled to ofl‘er for sale at considerably reduced prices, allowing the full value for Instruments in exchange. He is likewise extensively sup lied with ERARD'S DOUBLE-ACT ON HARPS, New, of the latest construction, and Second-hand, in the best preservation.